“We definitely came out with anger behind us […] we just came out ready, how we were supposed to come out,” said receiver James Tyrrell, describing the second half of his team’s home opener. That second half treated Stingers fans to one of the most exciting, high paced finishes at Loyola field in a long time. The same could not be said for the start of the game. Dropped passes and flags dominated a dull start that couldn’t quite get fans of Concordia, or the opposing Sherbrooke Vert et Or, out of their seats. With little over 20 minutes left in the game, Concordia found themselves down 12-0, having been unable to find a spark for their production. Regardless, the Stingers seemed undeterred in head coach Brad Collinson’s first game back at his alma mater. “Coach Brad came in and gave us a mentality of you have to keep fighting every minute because it’s a long game. Today it showed. It was a long game,” said quarterback Adam Vance. It certainly seemed long for Stingers fans who watched the team trail for all but four minutes of the game’s three hour runtime. Vance and his teammates had plenty to fight against early. From the first play, a missed pass to an open man, it seemed as if the Stingers had trouble developing a rhythm against Sherbrooke’s defence. Vance struggled against coverage that he hadn’t expected, throwing an interception and fumbling on a scramble near Sherbrooke’s end zone. “We were marching [down the field] in the first half but we were just shooting ourselves in the foot,” said Vance. Despite the slow start, he threw for 441 yards. 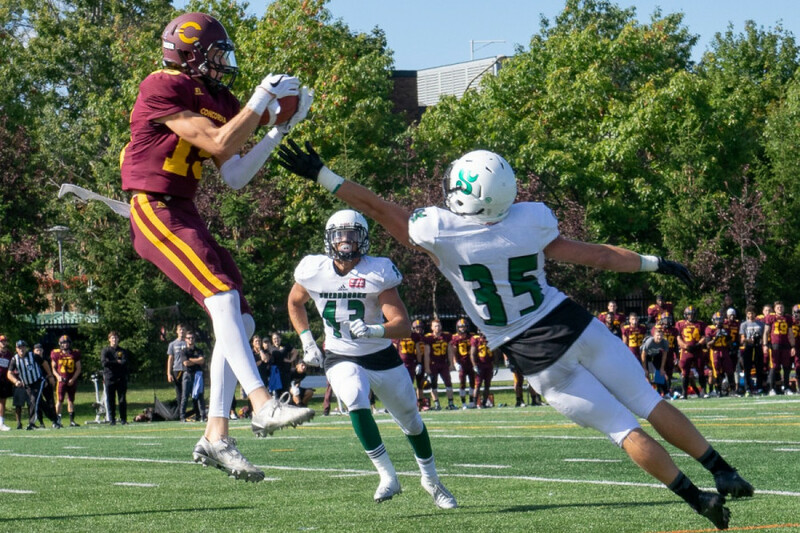 Whether it was the team’s four turnovers, 19 penalty flags (148 yards lost), or dropped passes in the end zone, whenever the Stingers seemed to find themselves on a roll or in a scoring position, they started suffering from self-inflicted wounds, including a goal line fumble that turned into a Sherbrooke touchdown. At halftime, shutout 9-0, Collinson said the adjustments were more mental than strategic. The crowd made sure to shout plenty of encouragement to Jarryd Taylor when he had trouble getting up late in the game. Photo Elisa Barbier. “I told them they have to look at themselves in the mirror and decide what they want to do,” said the new head coach. The team was far more capable of dictating play after that, according to Collinson. It helps to have a receiver explode for 258 yards on eight catches, of course. Jarryd Taylor exploded in the game’s final two quarters, accounting for more than half of the team’s receiving yards and demonstrating a deadly compatibility with Vance’s penchant for heavy throws. “I went into the locker room at the half and I only had two catches […] I’m the type of player that wants the ball in his hands on every play,” said Taylor. He seemed to get what he wanted as Sherbrooke scrambled to contain the third year receiver. Taylor and the rest of the offense seemed to fall into sync more and more as the game went on. Though Sherbrooke added 11 points of their own, Vance and Taylor, aided by a strong run game and timely catches by James Tyrell, stormed in to score 17 points in the game’s final quarter. Until the last play of the game it didn’t seem to be enough. James Tyrell’s touchdown gave the Stingers their first lead of the game.Photo Elisa Barbier. 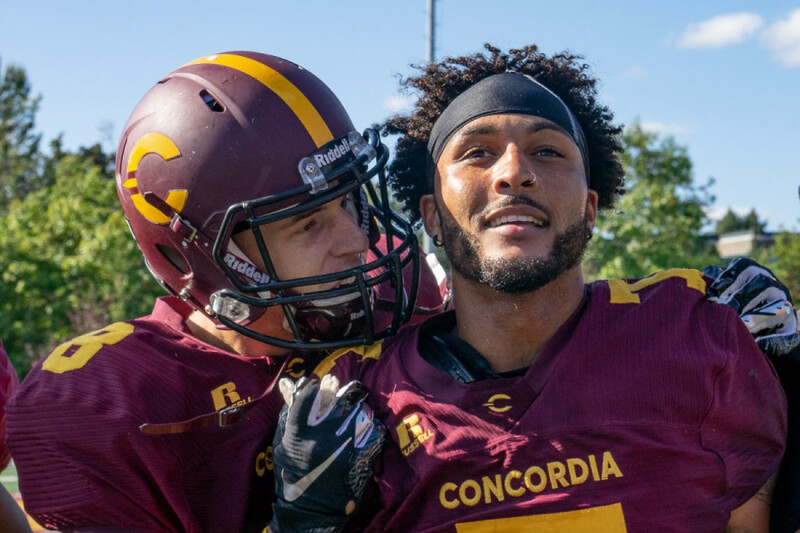 When the Stingers found themselves knocking on Sherbrooke’s door late in the fourth quarter, down just six points, they were turned away on second down with just a yard to go, and again on third down and inches with less than a minute left in the game . It looked to be a repeat of the first half. Dropped passes, missed opportunities, lack of finish, rinse, repeat, move on to next week. Instead of folding as the final minute wound down, the Stingers’ defence held down Sherbrooke’s run enough to force a safety, bring the score to 20-16 and give the offense one last chance with 15 seconds on the clock and 75 yards to go. With his number one target down, Vance knew immediately where he was sending the ball on the game’s final play. Twenty-five yards back and facing heavy defensive pressure, Vance launched the ball to Tyrell who found himself several feet in the air before touching down and being swarmed by teammates and fans alike. The Stingers hadn’t led at any point during the game. “That’s the stuff you dream of,” said Tyrell, smiling ear to ear. 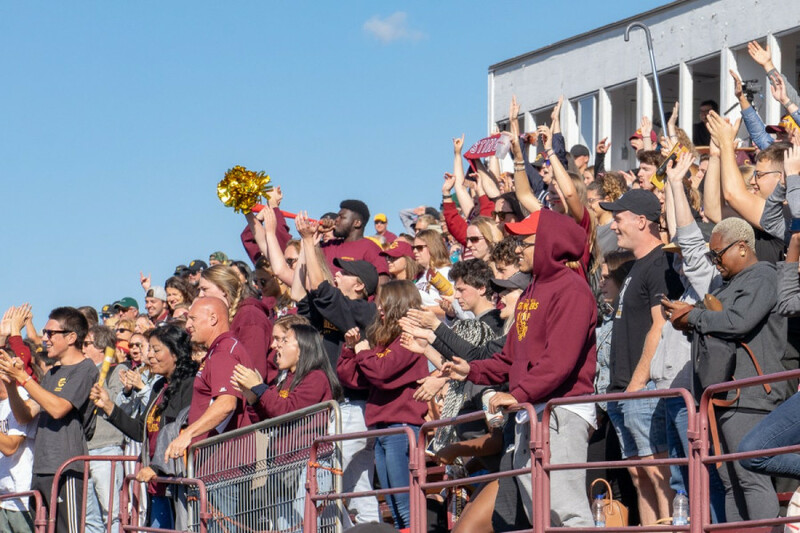 The Stingers will face McGill at Percival Molson Stadium on Sept. 15 at 1 p.m. for their next game of the season.